The idea for Lugaritz comes from the need to provide new housing solutions for older people by exploring a collaboration between the Municipality and a non-profit organization: Matia Foundation, because the existing housing market does not offer appropriate solutions for the older people. Lugaritz is a pioneering initiative based on the development of a person-centered network with a strong longitudinal research approach. It is meant to be evaluated and tested for future collaborative implementations. The Lugaritz housing complex provides a direct connection between the lower and upper part of the neighborhood. This vertical connection opens to a public Plaza in the upper level with great views to the city, south-east orientation and individual access to all the different programs located in the proposal: The Homes for the elderly, a Day-Center, a Cafeteria, a Nursery School and a Research Center. 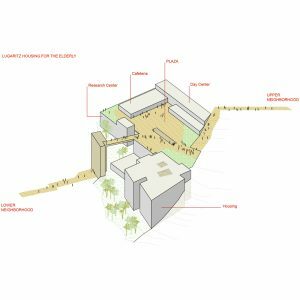 The new building and public space act as a meeting point for the neighborhood, an in-between space with an open character to be used by everyone. This project aims to be central to the neighborhood; showing how housing for older people can be attractive and integrated, while also being integrated in the community by supporting ageing in place through the creation of a social network. This project is mainly focused on couples where one of the partners has some degree of dependency. The participation of Matia Foundation and the availability of their resources assures the provision of services according to individual needs: a person-centered approach supported by research and real experiences. These services involve various professionals: nurses, doctors, day-careers, but also family, friends and neighbors to ensure the person ages as healthily as possible. This development is the first one if its kind in Spain. 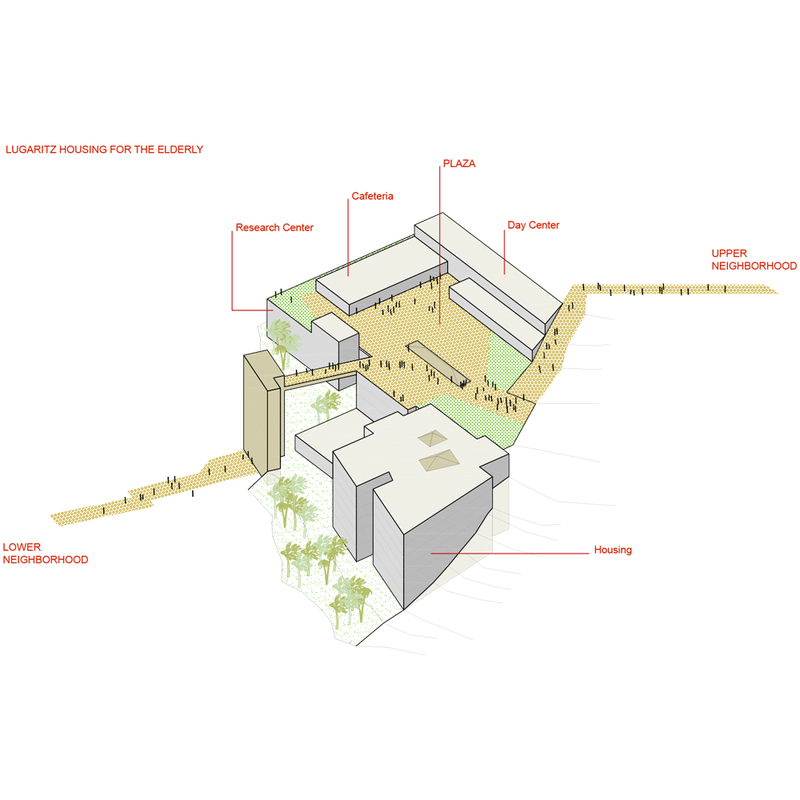 By merging architectural design with a person-centered environment, it aims to be a reference for similar initiatives. Other project lead: Matia Foundation. Non-profit Organization focused on providing care and services for the elderly based on a person-centred approach. How collaboration worked: This development is the first one if its kind in Spain and aims to be a reference for similar initiatives. It is based on the development of a person-centered environment with a strong longitudinal research approach. This approach is focused on the residents, who will be evaluated and tested periodically in relation whit life quality, life satisfaction, health and social services use, functional an cognitive health and social support . This will be possible by doing comparative analysis with existing traditional residential models for the future translation of the experience in the same region. Details on older people's involvement: During the design phase, a participative process was developed with specific groups: Alzheimer Relatives Association of Gipuzkoa (AFAGI), Neighbors Associations, older people involved in the Age-friendly Commission of Donostia/San Sebastián and experts in the field. During the construction phase, it is planned for future users to actively participate in the decision making. This development is the first one if its characteristics in Spain and aims to be a reference for similar initiatives. Based on the development of a person-centred ecosystem with a strong longitudinal research approach, it is meant to be evaluated and tested for future implementations in the same Region. Currently the project is finishing The Design Phase, so the reflections are related to this stage of the process. Our experience reflects on the difficulty, on a conceptual level, of defining a housing model non-existing in the Spanish context, but at the same time highly demanded. In a practical level, the main challenge was to fit this innovative approach into the existing housing regulations. The greatest challenge faced in this initiative is how to address people’s desire to continue living in their own home when they start to need extra help and services, and how to offer an alternative housing model away from institutions. This project tries to provide solutions for couples where at least one of the partners has some type of dependency, and for which institutional care is not an option.